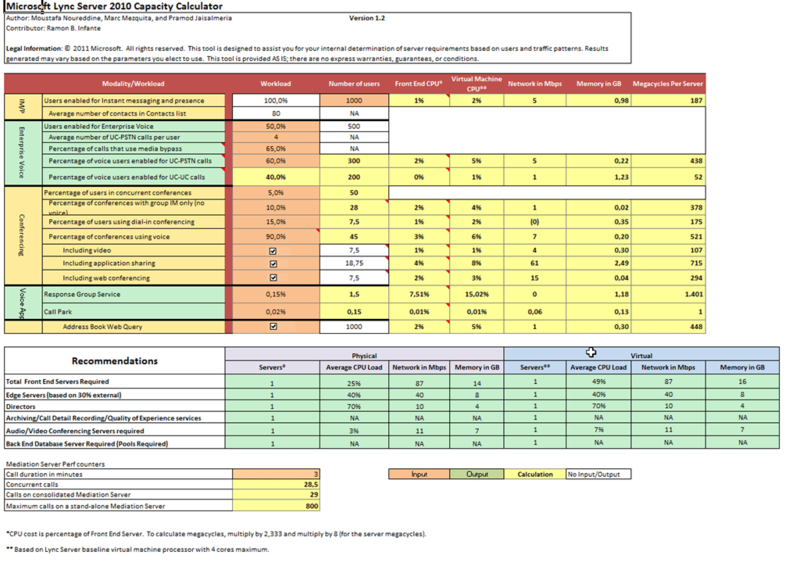 A handy spreadsheet for calculating a user’s hardware requirements based on information that the administrator supplies about number of users, types of communication and expected traffic has been made available by Microsoft. The download available by clicking here and the corresponding Microsoft Word document explains the tool and how to use it. Microsoft released a new Lync Server 2010 Documentation Help File. This document describes the call detail recording (CDR) and the Quality of Experience (QoE) databases schemas in Microsoft Lync Server 2010. This document guides you through the process of administering Lync Server 2010 Group Chat Server and the related components that are required to let organizations set up searchable, topic-based chat rooms that persist over time, allowing geographically distributed teams to better collaborate with one another while preserving organizational knowledge. This download guides you through the process of configuring the Announcement call management feature for Enterprise Voice. This download guides you through the process of configuring the Call Park call management feature for Enterprise Voice. This download guides you through the process of configuring the Response Group feature for Enterprise Voice. This document contains information for planning a deployment of Lync Server 2010 and Lync clients. Microsoft Lync Error: Microsoft.Rtc.Common.Data.SqlConnectionException Cannot open database xds requested by the login. The login failed. Login failed for user Domain\administrator. An error occurred: Microsoft.Rtc.Common.Data.SqlConnectionException Cannot open database xds requested by the login. The login failed. Login failed for user CONTOSO\administrator. Open the Windows Firewall program. Click Change Settings to open the Windows Firewall Settings dialog box. Make sure that Windows Firewall is turned on, and then click the Exceptions tab. Click Add port to open the Add a port dialog box. Enter a name for the port exception, such as SQL Server Browser Service. Make sure that UDP is selected, and then enter UDP port number 1434. This is the default port that the SQL Server Browser service listens on. Posted on January 6, 2011 Categories Microsoft, Unified CommunicationsTags Lync, Microsoft, SQL, WindowsLeave a comment on Microsoft Lync Error: Microsoft.Rtc.Common.Data.SqlConnectionException Cannot open database xds requested by the login. The login failed. Login failed for user Domain\administrator. Microsoft Lync Error: "Microsoft.Rtc.Management.Deployment.DeploymentException" "Cannot determine where to install database files because Windows Management Instrumentation on the database server is unavailable from your computer or user account. To continue, you can resolve this issue, or you can specify where you want to install the files." Error: An error occurred: "Microsoft.Rtc.Management.Deployment.DeploymentException" "Cannot determine where to install database files because Windows Management Instrumentation on the database server is unavailable from your computer or user account. To continue, you can resolve this issue, or you can specify where you want to install the files." Click Change Settings to view the Windows Firewall Settings dialog box. Verify that Windows Firewall is turned on, and then click the Exceptions tab. In the To enable an exception, select its check box window, scroll to locate the Remote Administration Program or Port exception. Make sure that the Remote Administration Program or Port exception is selected. Click OK to close the Windows Firewall Settings dialog box. Step 2: I had named the pool different than the server name, so I needed to add an A record or CNAME Record to DNS to get past. Posted on January 5, 2011 Categories Microsoft, Unified CommunicationsTags Deployment, Lync, Microsoft, View, Windows, Windows 2008, Windows 2008 R2Leave a comment on Microsoft Lync Error: "Microsoft.Rtc.Management.Deployment.DeploymentException" "Cannot determine where to install database files because Windows Management Instrumentation on the database server is unavailable from your computer or user account. To continue, you can resolve this issue, or you can specify where you want to install the files."